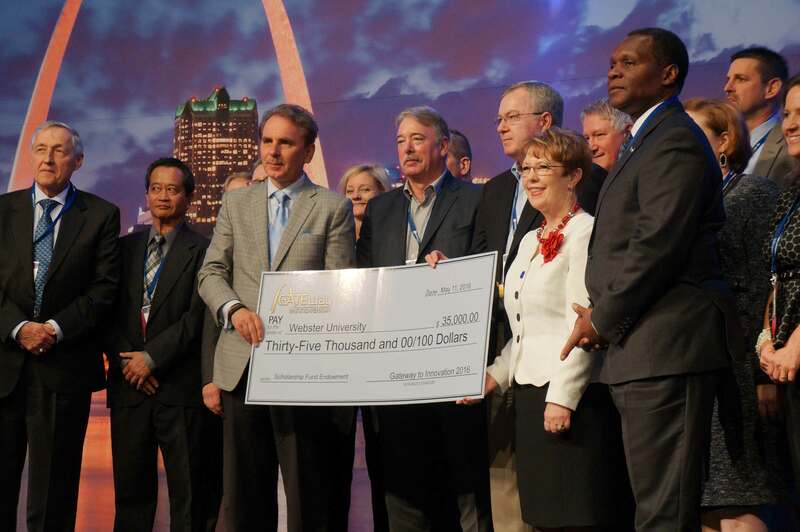 ST. LOUIS - The annual technology conference Gateway to innovation donated $35,000 to Webster University for a new scholarship fund Wednesday. President Elizabeth (Beth) Stroble, Provost Julian Schuster, Vice President of Information Technology Ken Freeman and George Herbert Walker School of Business & Technology Interim Dean Tom Johnson accepted the donation during the 10th annual conference, held in downtown St. Louis. The new award will be called Webster University Gateway to Innovation Scholarship and will be used to assist students studying technology or cybersecurity at Webster University. Gateway to Innovation has donated more than $1 million to the community since it was founded in 2006. The money has been used to establish scholarships, help non-profit organizations with technology needs or to fund STEM projects at area schools. 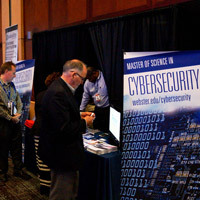 Besides accepting the scholarship, Webster University had a booth at this year’s conference with information about Webster University’s popular Cybersecurity graduate program at the Walker School. In addition, Johnson hosted a panel-discussion on the “Future of Cyberspace” and traced the evolution of cyber-crime to Information Security and to the creation of the Cyberspace Research Institute. The Cyberspace Research Institute’s role of applied research and advanced development included the formation of Webster’s Industrial Control Systems-Information Sharing and Analysis Center. The impact of cyberspace on the corporate world and the emergence and formation of new business enterprises was also reviewed in terms of scalability and future Cyberspace challenges. For more information about Gateway to Innovation, visit http://www.g2iconference.com. For more information on Webster University’s Cybersecurity program, visit http://www.webster.edu/cybersecurity.